Off late I came across this line “only a true bong can appreciate the difference between Fish fry and Mach -bhaja” :-) This is so true. 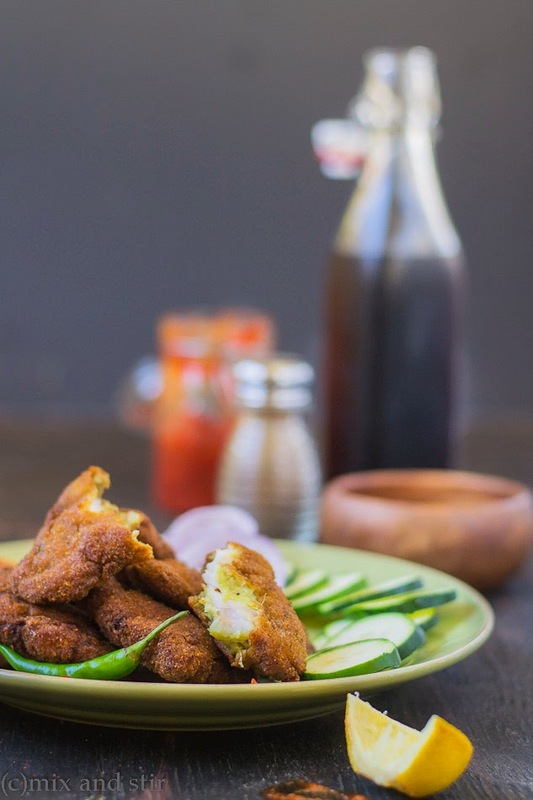 Most of the states outside Bengal generally refers Fish Fry as the steak pieces of fish marinated with salt, turmeric or something and then golden fried in hot oil. 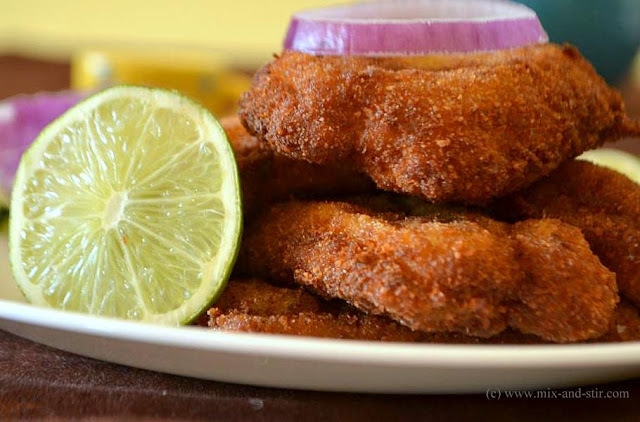 Bengali’s Mach(fish) Bhaja(Fry) is not exactly same, fried raw fish without any marination. But I think Fish Fry is more yummy than the normal “Mach Bhaja”. In Kolkata, Fish Fry, that is crumbed fish fillet fry was introduced at the time of British Era which was deshi form of fish and chips. It is generally served in a Bengali lunch or dinner Party and very popular as a starter. 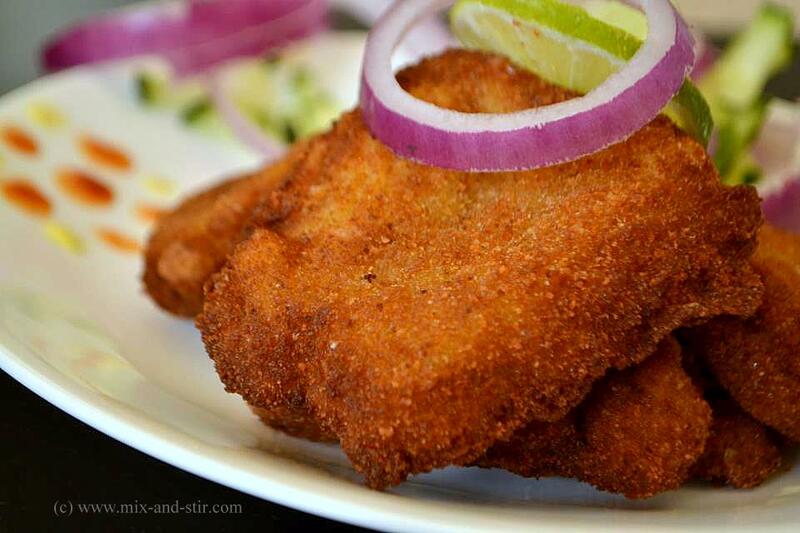 The original recipe or what we get at Kolkata by the name of Fish Fry is made with Bhetki fish. It is crunchy outside but soft, tender juicy inside which goes equally well with a cup of tea or as a snack. It is a very well known as street food too. Here, in United States, we do not get Bhetki fish, but make Fish Fry with Swai Fish, sometimes try with Tilapia or Cat fishes fillet too. They taste equally mouthwatering like Bhetki. Both the boys of my family love to eat fish and when it is Fish Fry, they can't stop smiling. The recipe is very easy one and not time-consuming either. 1. Fish fillet- (Skinless and boneless ) ( Swai, Tilapia ,Cat Fish or any white fish or Bhetki) 1 big fillet approximately 1lb. 2. Lime juice - half of a lemon. 1. 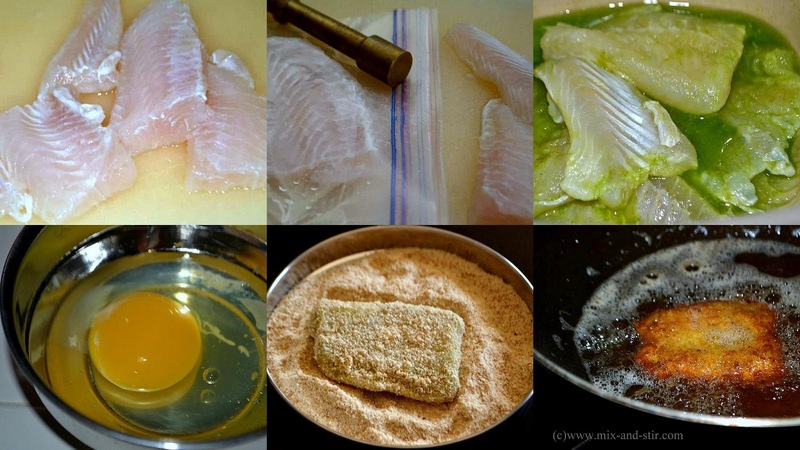 Cut the fish fillet into rectangular pieces, wash and pat dry. Put them in a Ziploc try to flat the fishes by pressing gently with a kitchen hammer. 2. Mix them with lime juice and salt, let the fish pieces marinate for 15 minutes. Make a fine paste with onion, ginger, garlic, green chilies and cilantro. If needed, you can add 2-3 tbsp water. 3. Take the pieces out from the first marinate. Then again marinate them with the paste and mix them well. All of the fish pieces should be nicely coated with the marinade. 4. Cover it and refrigerate them preferably for overnight, but If you are in hurry, one to two hour is fine too. Take the Fish pieces only, discard the excess marinate. 5. Make the egg wash by whisking the egg with 2-3 tbsp of water to have a smooth consistency. Spread the bread crumbs on a flat surface. First dip the fish piece in the egg then roll into the bread crumbs. 6. Make sure they are well coated with bread crumbs. If you want you can repeat the above process. It means dip them again in the egg wash and roll in bread crumbs. 7. Heat the oil in deep frying pan. Once it's ready, fry them one by one till they get nice brown color on the both sides. Take out them and place on a paper towel to absorb the excess oil. Fish Fry is ready!! Serve hot with mustard sauce( kasundi ) and salad, preferably chopped cucumber, onion and a wedge of lime. 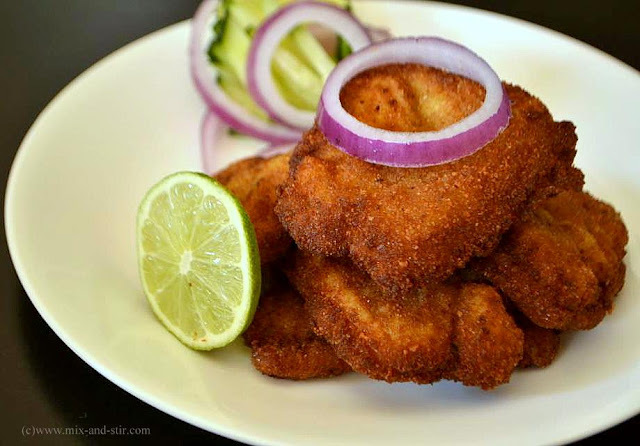 wow..fish fry looks very crunchy, inviting and yummy. Perfectly done and beautiful click. What kind of breadcrumbs do you use? 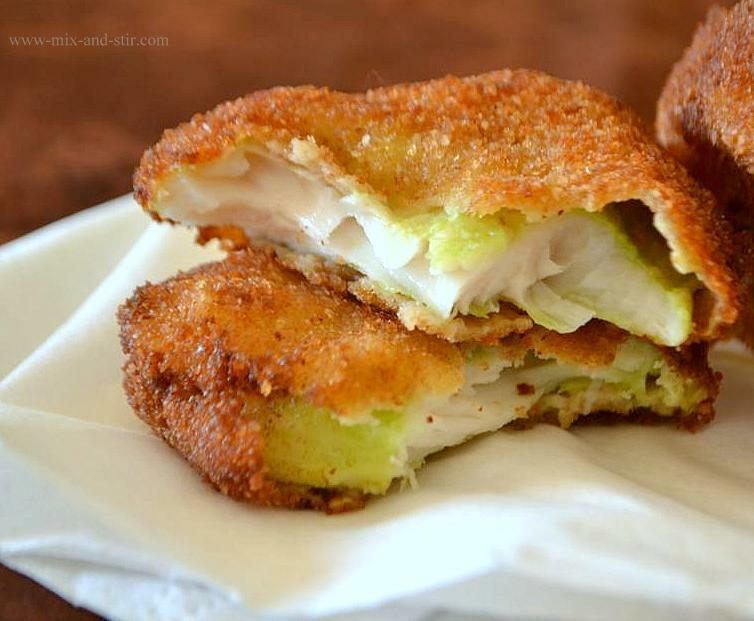 Is it panko?